Hey, hey! This week, look forward to a spot that serves healthy desserts, and a place for every bride-to-be, a super ethnic wear store with a varied collection. Lot's more lined up. Tune in to find out. 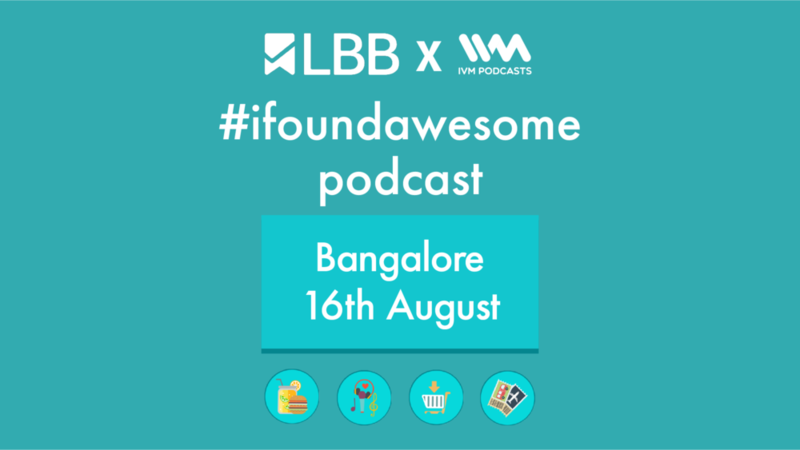 Bangalore has some cool things coming up this week. Like a rooftop cinema and a crazy pizza place that is perfect for your meatiest pizza ever! Tune in for more details! Are you a thali lover? What about a thali full of meat? Sounds exciting, right! You can definitely try this place out on the weekend for a kin-size meal! And there is lots more lined up for this week. Tune in to find out! Bengaluru! It's time you do your bit for the Kerela floods, we list out a few places that are organizing collection drives. So hurry, make this a part of your priority list. And yes, there are also some fun things lined up. Tune in to find out! Look forward to doing some awesome and quirky things this week! Like heading out to the zoo in the city and spending time with some penguins! And! Ofcourse, there is one more new dessert place in Bandra and you gotta check it out! Tune in for more awesome recommendations! There are some unique recommendations lined up for you, this week too! Head straight to what is a 'ceramic paradise' with some beautiful handmade tablewear, and you must also check out this art and movement based therapist. Tune in for more details! Lot's of good news for you, Mumbaikars! Your favourite comic store has found a new location (details in the podcast!) and there is an awesome granny who is making some cute potlis that could be great as gifts. Tune in! Look forward to some yummy Punjabi food on a food truck in the city, also, head to Lonavala for an awesome weekend and lot's more new stuff you can do! More details on the podcast. Look forward to a thrilling but soapy game of football at an awesome new spot in the city, and we tell you where to go for an ideal weekend getaway! Tune in for details. Look forward to a nice new eatery in Champa Galli, a restaurant which could be your 'Keto-paradise' and well lot's more in Delhi this week! Look forward to some cool and awesome new cafes, an all-new ceramic store and lots more in Mumbai this week. Tune in for more details! Hey, hey what's up Punekars! We will tell you what is up exactly! A picturesque waterfall worth checking out during the weekends and for those of you who don't have a fixed place to work at, here is a new co-working space! More details in the podcast. Bangaluru! Just as the season for weddings and all things festive is about to begin for the year, you can get into DIY mode! We tell you how, on this podcast. You can also head to a yummy cookie place to get cookie dough! Hey, hey! Dilliwale! There is some awesome and interesting stuff worth exploring this week: be it a list of healthy snacks that are great for your 4 pm cravings or a cool new tailor in Noida, who can help you upcycle that old saree that you haven't touched in years! More details in the podcast! Hey hey! We are excited about this week! A Goa restaurant is all set to open in Mumbai city (yay!) and we are giving you an awesome list of beer-brekkies that are absolutely worth trying. More details in the podcast!